Two years ago on the anniversary of 9/11, I wrote a post for the Publick Occurrences blog about the changes in public commemoration and memory as the number of anniversaries passed ten. I thought of it this morning on the 13th anniversary, and it seems even more true now. My freshmen were mostly born in 1996, and had only just started kindergarten when the events happened. Asking them about their memories of the event, as I note at the end of the post I intended to do in 2012, is now a futile endeavor. Already last year one group of students turned the question back at me, asking me to tell them what it was like that day because they don’t remember anything, save for perhaps a few foggy memories of their parents or other adults being upset. Yet for me, just seeing the date in print—”September 11″—causes me to wince involuntarily. The September 11 Museum is open in downtown Manhattan, standing as some measure of official memory. There will be official commemorations all day, from moments of silence in the morning to candlelight vigils this evening. And so time and the process of public remembering continues. Below is the full text of the original post. You can view the original and comments here. I wrote about the anniversary of the September 11th attacks on my Facebook page this morning, but I’d like to share my thoughts in a more public forum, in large part because I’ve been thinking about September 11 more and more through the years from the vantage point of a professional historian observing the development of public memory and history in real time. What has struck me this week and today especially is that we seem to be moving into a second phase of public memory, one in which the event has become a bit more distant and is beginning to shift away from the visceral and universal commemorations of the first ten years. Marking a decade since the attacks last year seemed like we’d come to some sort of round number that could allow most of us to exhale (in a way). That doesn’t hold for everyone, of course, as each experiences it in his or her own way, not to mention that I was blessed not to know anyone personally who died. But as a collective and public matter, we are starting to transition from remembering the event as something that happened to us to recalling it as something that happened to us in a slightly different time. This year when the names of victims were read at the World Trade Center site, no politicians were present, only family members. 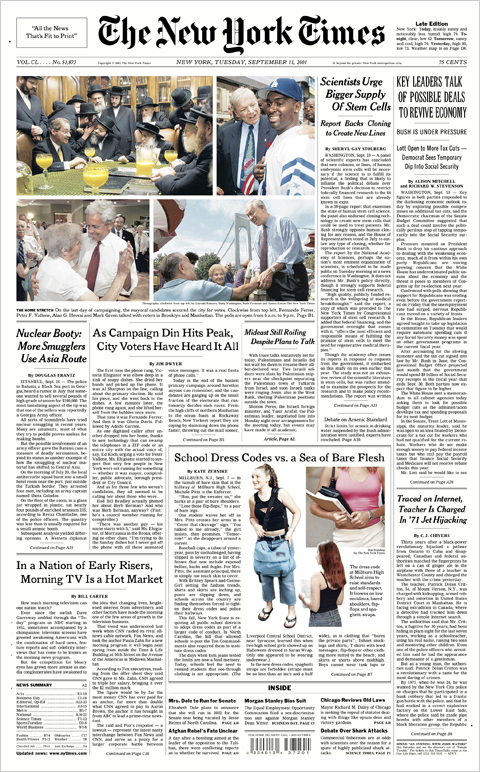 While many newspapers covered the anniversary, the New York Times notably excluded it from its front page this morning. The President and First Lady observed a moment of silence from the lawn of the White House, but unlike four years ago, when Senators Obama and McCain appeared together at the New York ceremony, President Obama and Governor Romney will not meet today, though each participated in remembrances. At the same time, debates have continued about what to do at the site of the World Trade Center. The “Freedom Tower” has been downsized in name if not in height to simply “One World Trade Center.” And until today there was still a dispute between the city and the state of New York over funding for the 9/11 Memorial and Museum. For those of us old enough to remember, we always will – I know that I remember exactly where I was when I heard about the planes, when I first saw that the towers had fallen, the weather that day (which is true for many, it seems). But after eleven years, many Americans simply don’t remember. Of my students, about half are freshmen, and they were only in the second grade in 2001. What will they remember first-hand about that day? My guess for many (based on my memories of being seven years old) is not a whole lot. And their numbers will only grow over time. For my son, 9/11 will always be history. The process is necessary and inevitable. Our collective memory of Pearl Harbor, for instance, or the Kennedy assassination, has changed dramatically over time as those events have receded in time, as new people with no direct connection have grown up and as those who had one have departed the scene. As a historian (though not of public memory, to be honest), what I find fascinating is watching this process happen in real time. I’ve read and taught Alfred Young’s work on George Robert Twelves Hewes and the memory of the American Revolution, followed Kevin Levin’s blog Civil War Memory, and read and discussed countless other works about memory and events in American history, but this is a story unfolding before my eyes, and in which I am a participant. And while the process is inevitable, it must in many ways be organic. Did you know, for example, that today is Patriot Day? I didn’t remember that, and only recalled because someone saw it on a calendar and asked me the difference between it and Patriot’s Day (the commemoration in Massachusetts of Lexington and Concord that occurs each April). Despite Congress’s efforts to retitle the day, everyone remembers it simply as September 11 or 9/11. And even that may shift over time, as it becomes necessary to explain what the date means to people for whom it never had the significance which we attach to it. In total, it’s a reminder to me to think carefully about how we approach both the past and the present, to be sensitive to historical processes, and to put arguments today into a rich context that recognizes a shifting field of memory. It may also prompt me to ask my students about their memories when I see them tomorrow morning. NOTE: Kevin Levin was interviewed this morning for an NPR segment on remembrance and healing. It’s a fascinating listen if you have a few minutes.